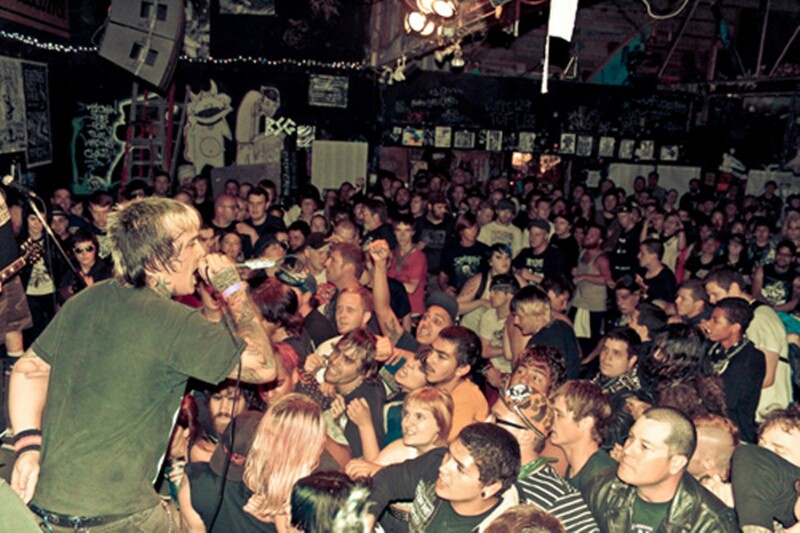 A look back at the venerable East Bay punk venue's first quarter-century. 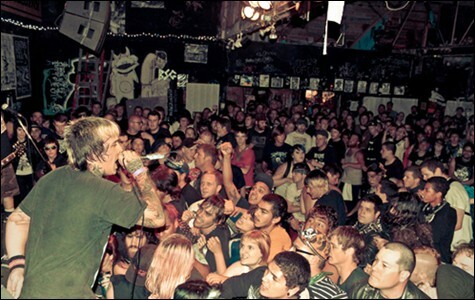 We love the 924 Gilman Street warehouse unequivocally. Now as the club celebrates its silver anniversary, we thought it prudent to say how much we've appreciated 25 years of cheap, all-ages, all-volunteer-run, drug-and-alcohol-free punk shows, at a place where anyone could go and feel welcome. And with that in mind, we asked a few local artists, writers, and Gilman volunteers to share their fondest memories of the place. Jesse Townley (aka Jesse Luscious), general manager of Alternative Tentacles, Berkeley rent board representative, member of Blatz, The Gr'ups, The Criminals, and The Frisk: "This is cheesy, but I always loved the tight-knit friendships that began at 8th & Gilman. One of my favorite manifestations of this were the Tuesday night hang-outs that happened 1990-1992. A bunch of us regular volunteers and band members would meet at Gilman around 10 or 11 p.m. and then go on a skate mission or explore the bunkers in the Marin Headlands or go up to the wind pipes that used to be behind Lawrence Hall of Science or run around Albany bulb .... One skate mission started at the top of Market Street, way up near Twin Peaks, and ended up on the deserted, earthquake-damaged remains of the Embarcadero Freeway a few hours later. Craig "Craigums" Martin Billmeier (aka Hot Lixx Hulahan), international Air Guitar Champion and member of Your Mother, Love Songs, What Happens Next?, Conquest for Death, This Is My Fist!, and All You Can Eat: "My favorite Gilman memory, huh? How does one have one favorite memory? That's like having a favorite band, it just isn't possible! But how about this? There is a guy named Steve List. Every week he would print a one-sheet flyer with every show in the Bay Area on it. In very small type you could find out every band playing every basement, living room, community center, rec hall, club, etc. for the foreseeable future. He told the date and address and whether the show was all-ages or 21+. And if the event warranted it he gave it a "pit warning" (which he signified with an "@" — which for us meant no @ = no us.). He could be found with a burlap sack dancing at the front of the Gilman stage, simultaneously helping people stage dive and passing out The List to anyone who asked. I credit him, as much as any band or venue or zine or whatever, for bolstering the Bay Area scene as we know it today (Steve now does an online version of The List, and it is as thorough as always)." Cassie Harwood, Express calendar editor and former Gilman volunteer: "I don't go to Gilman much anymore, but I think I'll always love that place. It's where I saw one of my first shows, had my first kiss, drank my first beer (far down the street, of course), made my first friends, and worked one of my first jobs. It's strange to think that it's been over a decade now that I used to drive my mom's car out from Crockett every weekend to go to every Gilman show I could, and later, when I moved to Oakland, peddle my bike miles across town to hang out there. My fondest memories of those times are the years when I worked in the Gilman "stoar." That's when I was given a huge, jangly set of keys to the front door and to all the many locks associated with my snack-slanging tasks. For a seventeen-year-old, it felt pretty cool and important to have that sort of responsibility. And I loved it. Before each show I'd make the coffee, fill the water cooler (from a spigot in the boy's bathroom), lay out the chips and candy, pop a tape in the boom box (Gorilla Biscuits, Grimple, Black Flag ...), and watch the people stream in. It's really comforting to know that even as volunteers come and go, there's always someone willing to step up to keep that place going." Bucky Sinister, poet, writer, and comedian: "When I first saw a show there in 1989, the prevailing attitude was that I had showed up too late. I saw a lot of classic Blatz, Filth, and Green Day performances that were going on around that time and the next few years. My first memory is being horrified at the sight of people's parents dropping them off. I was shocked that anyone was okay with their kids going to a punk show. In the Midwest, it was a "don't tell your parents" type of thing. Teens had to sneak out of the house and change clothes in the car on the way there. In the Bay Area, people got into punk really young. They could get to shows and be somewhat safe. Gilman made a lot of that possible." George Chen, writer, comedian, founder of Zum magazine and record label, frontman of K.I.T. and Chen Santa Maria: "I spent about two years going to Gilman somewhat religiously between 1994 and 1996. The first show was in the summer of 1993. Monsula was supposed to headline but cancelled for some reason, all I remember is that Crackerbash from Portland headlined. The online List archive only goes back to 1994 so those memories are pretty much lost to the ages. It's hard to maintain much objectivity about that time, so I won't. It was glorious and terrible to be a self-conscious teenager thrust in the cauldron of self-conscious teens and adults who I admired and resented in varying degrees. I remember many awkward times when I felt like I did not belong and my attempts to socialize with the black-clad Neurosis-y types. I saw Jawbreaker, Bikini Kill, Huggy Bear, Locust, and Pinhead Gunpowder. Lesser known but still memorable acts burned into my mind: Roger Nusic (running around the warehouse with a wireless mic), Fibulator, Trenchmouth, and New Bad Things. I saw Miranda July do one of her early performances. There were other venues at the time that did even weirder music, so it's funny in retrospect to think of Gilman as the big leagues, but that was the case. In the interest of full-disclosure, I also worked as a publicist on Jack Curran's documentary, 924 Gilman Street: Let's Talk About Tact and Timing, that came out on Alternative Tentacles in 2008. I would tell you to watch that, but really, you should just go to the club if you never have. At this point it could be an actual 'how I met your mother' locale." Dan Abbott, Geek Fest co-founder, guitarist for Bobby Joe Ebola and the Children MacNuggits, and Thee Hobo Gobbelins: "My favorite Gilman show was around 1998, when my old band The Bob Weirdos played with a bunch of pop-punk bands. Under the pretense of a super-pretentious high-art performance called 'The Cage,' we hung a chain-link fence from the rafters, between the stage and the audience. Then we lit ourselves on fire, got naked and vomited into a bucket. Then we lit the vomit on fire and hurled it at the audience, screaming 'Now who's in the cage?!' Meanwhile, our friends outside had nailed more chain link fence over the exits. Terrified teenagers attempting to flee found themselves trapped inside with us, naked, screaming, and covered in flaming puke. Art at its best is terrorism with a door charge." Mike Park, founder of Asian Man Records, lead singer of Skankin' Pickle: "Many great memories at 924 Gilman, but seeing Crimpshrine and Capital Punishment in 1987 was such an amazing experience. Seeing people riding big wheels in the pit and then buying an east bay sampler for $2 at that show introduced me to Basic Radio, which led me to Operation Ivy. And now 25 years later I'm still doing this punk rock thing? Ahhhh .... Thank you Gilman." Wendy-O Matik, writer, radical-love activist: "Back in the late Eighties and early Nineties, 924 Gilman was my refuge and the place I called home. Over two decades later, I'm so grateful that 924 Gilman still plays a vital and supportive role in my life by hosting my Radical Love & Relationship Workshop every year. Who would have thought that some twenty-odd years since I first walked through those 924 Gilman doors, donning my punk rock outfit, that I'd be facilitating a polyamory workshop for those daring enough to push the boundaries on patriarchal concepts of a relationship. 924 Gilman rocks!" Conan Neutron, frontman of Victory and Associates: "There is no place like 924 Gilman on the planet. No place! Whether it's the sweaty, crazed Babyland shows over the years, a live band up there with the best of the best and every show a treasure and potential life-changing experience. Whether it's that or some brand-new group of young-uns' first or second show trying to hold it together, or taking my turn rocking on the stage to tuned-in and super-awesome folks who actually *gasp* care about the music and the words, and not as a background for getting wasted. See: The music isn't a byproduct of trying to sell things at Gilman, it's the actual center and purpose and I wouldn't have it any other way. Gilman is one of a kind and an absolute Bay Area treasure. Nobody is above anybody else, it's about taking turns and it's one of the truest embodiments of DIY and punk rock that I can think of. There is no place like it in the world that has the combination of staunch and proud ethics, dedication to community. I hope to still be going and playing it when I'm sixty." Ariel Schrag, cartoonist and television writer: "Ohh Gilman .... I mainly went in high school, but in college I was home for the summer and went there with a college friend also from the Bay Area. My friend decided she wanted to seduce a fourteen-year-old punk boy and did just that. He was a pudgy boy with an earnest attempt at a mohawk and she strolled up to his group of friends and started talking to him. Nothing too scandalous happened, just kissing and maybe a little groping in one of the graffiti-sprayed bathrooms, and then he called her every night after school for a month. Sometimes it's about making other people's memories happen."